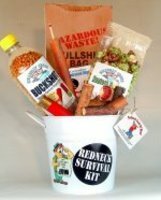 The new food distributorship Hillbilly Creek, from Rednedkgifts.net combines gourmet food products with humorous labeling - providing the freedom to create unique quality concept gifts such as Unexplained Files, Swamp Thing, and Redneck Survival Kit. This is just the beginning for Redneck Gifts and Hillbilly Creek. With new concept gifts developing weekly, there is no stopping the creative outlet for this unusual gift company. With the capability to hand select food products and with the talented writers on staff, this is just the start of what is possible for this gift company. Look for politically inspired gifts coming in late fall. Expanding beyond redneck, Redneckgifts.net is driving further than anything ever seen before in the gift industry. What makes the products and gift concepts so unusual is the ability to connect the humor with the food product using comical labeling, and combining it with a concept within the container using decals to describe the gift. When sending a Redneckgifts.net gift, the recipient knows what the gift is about immediately. The decal on the container speaks loud and clear and sets the pace for the humor inside. Hunters Reserve has teamed up with Redneck Gifts to further enhance the gifts with their wild game (venison, wild boar, and pheasant) summer sausage. Poorfish creates the Dehydrated Water, and CRM Farms supplies the Fartless Chili Makins. Hillbilly Creek plans on expanding the line of gourmet food products, by adding more of Daisy's Old Time Confections homemade chocolates and candy. Michelle Larsen, owner of Redneckgifts.net (http://www.redneckgifts.com) along with IdahoGiftBaskets.net (http://www.idahogiftbaskets.com -- Creative Gift Baskets, LLC) has been operating her gift baskets business since 2001, and is continually searching for unique ways to showcase products in the gift basket industry. Creative Gift Baskets has been featured on many radio shows and contributed products for the Emmy Awards gift bags to the stars in 2006.